Worldwide excitement over the possible discovery of a new fundamental particle, the Higgs boson. spilled onto campus Friday,July 13, as hundreds of people – more than the Valley Life Sciences Building’s Chan Shun Auditorium and an overflow room could hold – turned out to hear UC Berkeley physicists explain the hoopla. Physicists Lawrence Hall, Beate Heinemann, Marjorie Shapiro, Josh Ruderman and Louise Skinnari spoke during a lecture and panel discussion moderated by L&S executive dean Mark Richards in a July 13 presentation about the Higgs boson. 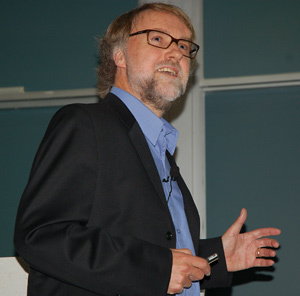 Heinemann is a member of the ATLAS experiment team, one of two large collaborations that announced their results July 4. The reigning theory on how matter and energy interact, the 50-year-old Standard Model predicts a Higgs field that permeates all of space. Particles moving through it interact and gain mass, like swimmers slowing down as they moves through water, Heinemann told the crowd. The more particles interact with or slow as they move through the Higgs field, the larger their mass. Theoretical physicist Lawrence Hall noted that the field can’t be detected directly, but Peter Higgs in 1964 pointed out that this field should have an associated particle, the Higgs boson, that would be detectable. In a classic 1975 paper, UC Berkeley physicist Mary K. Gaillard and two colleagues considered a wide range of masses for the proposed particle, and the newly discovered boson was found at the upper limit of that range. “This influential paper started the search for the Higgs boson. These were the first calculations of how we could imagine finding the Higgs boson,” Hall said in a shout-out to Gaillard, who was in the audience. The dream of detecting the Higgs boson drove European governments to pool almost $10 billion dollars to build in Geneva, Switzerland, the Large Hadron Collider, which was completed in 2008 by the European Organization for Nuclear Research (CERN). At 16.5 miles around, the state-of-the-art particle accelerator dwarfs the first particle accelerator or atom smasher, a 5-inch-diameter device built by UC Berkeley’s Ernest O. Lawrence in 1932. Theoretical physicist Lawrence Hall explains the theory behind the Higgs boson. Jean Smith photo. “We are just looking for what we think are the basic elements of the theory of nature,” Hall said of the huge, 10-year project to build the collider. And if the two teams are right, the Large Hadron Collider has been a success worthy of a Nobel Prize. The Higgs boson is, in fact, a third “type” of elementary particle. The big question now, he said, is whether the new particle discovered by the ATLAS team and the competing CMS team is really the Higgs boson. The new particle was created by slamming two proton beams head on, generating half a billion proton-proton collisions per second, each of which annihilates into 3,500 billion electron volts (gigaelectron volts, or GeV) of energy from which a Higgs boson might emerge. The ATLAS experiment alone analyzed 800 trillion collisions between the time the beam turned on in 2010 and June 2012. Of these, eight interactions appear to have produced a Higgs boson that decayed in a characteristic way (a pair of Z bosons), while about 200 decayed into two photons. According to Heinemann, the chances of this happening if there is no new particle is 1 in 3,500,000, which in the world of particle physics counts as the discovery of a new particle. The CMS team counted a similar number of interactions with the same level of certainty. 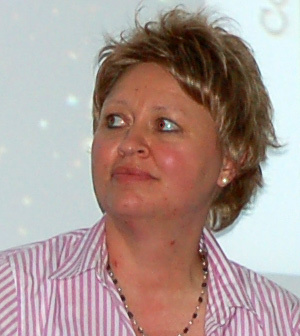 Physicist Beate Heinemann coordinated data preparation for the ATLAS experiment at the Large Hadron Collider. Jean Smith photo. The observed mass, between 125-126 billion electron volts (125 – 126 GeV), is within the range of masses predicted for the Higgs boson, though Heinemann acknowledged that that range is very large, up to 700 GeV. “We know we have discovered a Higgs-like particle, but don’t know if it is the Higgs,” she told the crowd. The Large Hadron Collider continues to collect more data around the clock, which should tell experimentalists whether the particle’s spin and other properties coincide with predictions for the Higgs boson. If not, physicists won’t be too disappointed. In part, the panelists said, this is because the Standard Model Higgs has problems. To fix them, alternatives have been proposed that involve a composite Higgs – one composed of other matter particles – that has extra spatial dimensions beyond our three known multiple universes and something called supersymmetry. “The Higgs is a horrible, horrible thing. It is not like the beauty of the matter particles and force particles connected by symmetry; the Higgs is this horrible object that we are forced to put into the Standard Model theory in order to get complexity,” Hall said. Some variants of the Standard Model, for example, predict not one but five Higgs bosons. When the Large Hadron Collider reopens in 2014 after a year of upgrades, its energy will double, and other Higgs particles may be seen. The dominant variant, however, is supersymmetry, which was first discovered by UC Berkeley physicist Bruno Zumino in 1974 and applied to the Standard Model in the 1980s. The implications of discovering the Higgs, if it is a Higgs, Hall concluded, is that theorists must now confront the problems in the Higgs Standard Model and come up with tweaks to the theory. “If I had to guess, I would guess that it is going to be supersymmetry,” he said. In fact, supersymmetry predicted that the mass of the Higgs boson could not be more than 135 GeV, which is just above the observed 125 GeV. All this uncertainty is good news for the next generation of physicists, represented by fellow panelists Miller post-doctoral fellow Josh Ruderman and graduate student Louise Skinnari. “What for me is most exciting is finding out whether this is consistent with the Standard Model and whether this is an indication of other new physics,” Skinnari said. And as the Large Hadron Collider produces more and more data, young scientists like Ruderman and Skinnari have the opportunity to discover new stuff. Diagram of a two-photon decay of a Higgs boson in the ATLAS experiment at the Large Hadron Collider in Geneva.